The 2007 deployment of nearly 30,000 additional U.S. troops to Iraq, colloquially known as ‘the surge,’ cast a long shadow over subsequent U.S. foreign policy, including the 2009 decision to similarly ‘surge’ troops in Afghanistan. It will further affect the upcoming confirmation hearings for Secretary of Defense Chuck Hagel, where Hagel’s opposition the surge while in the U.S. Senate is likely to be a topic of discussion. Supporters of the decision in Iraq have claimed that the reduction of violence and political stabilization in Iraq in 2007-2008 was substantially due to the surge. Skeptics of the surge have highlighted other factors endogenous to Iraq as being equally, if not more, important, yet it is the pro-surge viewpoint that has dominated the public perception of Iraq. Thus the question of what actually reduced the violence in Iraq remains open even as policy is made on the assumption that the surge was primarily responsible. Stephen Biddle, Jeffrey Friedman, and Jacob Shapiro (hereafter Biddle et al.) have commendably applied social science to resolving this debate. They do so by first defining the contending hypotheses about the reduction in violence and then analyzing both quantitative and qualitative empirical evidence to test these hypotheses. 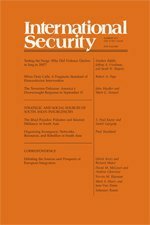 In the interest of full disclosure, I note up front that in a forthcoming letter to the journal International Security my colleague Jon Lindsay and I critique the article, particularly on empirical grounds. This review, while inevitably touching on the same material to some degree, is not intended to simply restate the arguments in that correspondence. Instead it focuses on epistemological issues related to the authors’ evidence (and similar evidence from similar conflicts). Biddle et al. argue that there are four central contending hypotheses about the reduction in violence in Iraq. First is the surge hypothesis, which actually has two components. The first component is the additional troops of the surge, while the second is a purported change in tactics by U.S. troops which was imposed by the new commander in Iraq, General David Petraeus. The new tactics are described by Biddle et al. as involving “…smaller, dispersed bases, dismounted patrolling, and direct provision of U.S. security for threatened Iraqi civilians” (8). The second hypothesis focuses on sectarian cleansing, arguing that one of the main causes in the reduction in violence is the unmixing of previously mingled Shia and Sunni Arab populations through violence. Mixed populations resulted in a security dilemma and a spiral of violence. The process of sectarian cleansing, terrible as it was, eventually produced homogenous and defensible sectarian areas and thus a reduction in violence. The third hypothesis involves the impact of the ‘Awakening,’ a reference to the decision by various Sunni Arab fighters, including tribal gunmen, nationalist insurgents, and former members of the Ba’ath regime, to side with U.S. forces against Al Qaida in Iraq (AQI), which was the most powerful element of the Sunni insurgency. Biddle et al. describe the motivation of the non-AQI Sunnis as being driven by “… U.S. payments of $300 per fighter per month… and a promised cease-fire” (18). The defection of these Sunnis provided both additional manpower and intelligence on AQI, thereby dealing the organization a devastating blow that reduced violence. The fourth hypothesis is that only synergy between the surge and the Awakening can fully explain the reduction in violence; both were necessary but not sufficient in themselves to cause the dramatic reduction in violence. Absent the troops and tactics of the surge, they argue, the Awakening would not have been able to survive the counterattack of AQI against defectors. Absent the Awakening, the troops and tactics of the surge would only modestly have reduced violence. The authors sum up this hypothesis by declaring that “[t]he surge may not have been large enough to suffocate a determined insurgency, but it was large enough to enable cooperation with turncoat Sunnis and exploit their knowledge to direct coalition firepower against the still-active insurgents, enabling them to survive the kind of retaliation that had crippled their predecessors” (26). In order to evaluate these hypotheses, the authors use two primary sources. The first is the declassified Multinational Force-Iraq (MNF-I) ‘significant activities’ (SIGACTs) database. SIGACTs provides data on all violence “…involving coalition forces, Iraqi units, insurgents, or sectarian militias reported through MNF-I channels” (11). The data include the time, date, location, and some detail on the type and nature of violence. The second source is an original set of seventy structured interviews with military personnel who served in Iraq during the years 2006 to 2008. These sources were supplemented by additional secondary source data. This use of both quantitative and qualitative data is sophisticated and on the surface compelling, though as discussed below the fact that essentially all of the primary data originates from U.S. sources is problematic. Using this data, Biddle et al. demonstrate that rather than the sectarian cleansing’s pattern of violent homogenization of neighborhoods, much of the violence in Baghdad was marked by active conquest of Sunni neighborhoods by Shia militias, principally Jaysh al-Mahdi (JAM). This violence saw the formation and advance of more or less continuous if irregular frontlines throughout the city. In mid-2007 there was still Sunni territory to conquer. Therefore there is no logical reason, they argue, why violence driven by conquest would begin to fall in that time period. In evaluating the Awakening hypothesis the authors present a counterfactual argument: if no surge had taken place would the Awakening have successfully reduced violence? They highlight four attempts by Sunni groups to align with U.S. forces against AQI prior to the surge and argue that all four attempts failed as AQI crushed the renegade Sunnis. They argue that the reason for this is that pre-surge U.S. forces had neither the troops nor the tactics needed to protect Sunnis who were seeking to realign. Only post-surge could the Awakening succeed, even if the Awakening itself was critical to the reduction in violence by reducing the size of the insurgency, providing intelligence to U.S. forces, and altering the Shia perception of and incentives for violence. Finally, in evaluating the surge hypothesis, the authors compare the slope of the decrease in violence as measured in SIGACTs in various areas of Iraq before and after Sunni realignment. They measure Sunni realignment by the establishment of a quasi-official local defense force known as “Sons of Iraq” (SOIs) in the area. They demonstrate that the slope of decreasing violence prior to SOIs was typically quite flat (on average 2.5% a month) or even positive but went into steeper decline after SOIs in many areas (on average 5.8% per month). In other areas violence continued to increase for a short period even after SOIs but then began to decline as well. Biddle et al. argue that absent the Awakening, the surge might have reduced violence but would have taken much longer to do so and would have been more costly, and in all likelihood therefore would have been less stable after the end of the surge. The authors’ evidence, both quantitative and qualitative, therefore seems to support the synergy hypothesis. Neither the surge nor the Awakening alone provides a compelling explanation, but together they explain the rapid reduction in Sunni violence as Sunni turncoats and U.S. forces hammered AQI. This in turn, according to the authors, undermined the cohesion of Shia militias and allowed U.S. forces to concentrate on JAM, which then compelled a JAM cease-fire and the overall reduction in violence. Leaving aside the accuracy of specific empirics, the central epistemological question raised by this article is how accurately U.S. sources captured the dynamics of a conflict principally driven by Iraqis? The authors note there are problems with the sources: “SIGACTs undercount actual violence, because they record only episodes reported to coalition authorities and then entered into a database. In addition, SIGACTs do not measure the intensity of violent events. Participant interviews are only as good as the accuracy of the participants’ observations and recollection” (12). Yet they argue that these issues are relatively minor, calling the qualitative and quantitative data sources “an unusually objective and consistent base of information, both for tracking changes in violence over time (which helps control for underreporting) and for identifying changes in local political dynamics, both of which are critical for our analysis” (11-12). Unfortunately, the issue of reliability of the data cannot be so easily dismissed. SIGACTs do track at least some violence but violence does not necessarily tell us very much about the local political dynamics that the authors claim are important. For example, imagine an area in which violence observed by or reported to U.S. forces is zero. This could mean that U.S. forces have successfully driven insurgents out of the area or it could mean that insurgents have established such comprehensive control over an area that violent action is either not necessary or never reported to U.S. forces. A decrease in number of violent events (which SIGACTs would capture) could be accompanied by an increase in intensity (which it would not) and the consequences of fewer but more violent events would be hard to predict. Violence could also simply be shifting away from areas where U.S. troops are present, so that what appears to be a decline is simply a geographic shift. Yet the epistemological problems of the quantitative data pale compared to the problems in the qualitative data. The authors’ description of the critical changes in local political dynamics is almost entirely derived from the perceptions of U.S. officers; a close reading of the footnotes reveals only one passing reference to an interview with Sheikh Sabah, a tribal leader from western Anbar province that appeared in a 2009 Marine Corps collection of interviews with Iraqis. If one believes that the “observations and recollection” of the interviewed officers accurately capture reality this is not an issue, yet there are a host of reasons to believe that the observations of U.S. officers have substantial limitations, particularly where Iraqi perceptions and politics are concerned. First, there is the simple fact that only a tiny fraction of U.S. personnel in Iraq spoke Arabic. This meant that virtually all assessments of and communications with Iraqis were mediated by interpreters (often dismissively referred to as ‘terps’ by U.S. forces), leaving U.S. officers vulnerable to possible translators’ sins of both omission and commission. Some interpreters may have had motivated biases to frame communication in a certain way, others may simply have lacked complete mastery of both Arabic and English (even those that spoke both languages may have had trouble with the Iraqi dialect), while some may not have had a good relationship with U.S. personnel. Beyond the interpreter issue there are more questions and issues. How accurately did Iraqis convey information to their American interlocutors? How well did U.S. officers understand the motivations and perceptions of Iraqis hostile to U.S. forces (and therefore unlikely to directly converse with U.S. officers) such as Shia militiamen or Iranian intelligence officers? U.S. military personnel typically were deployed from six to fifteen months depending on time and unit. One thus wonders how long the individuals were in place to be able to actually learn about their Iraqi counterparts? These issues are hardly unique to Iraq. In a recent history of U.S. Army efforts to measure progress in Vietnam, the author notes that “[r]elying on interpreters, Americans too often gathered only what local officials wanted them to hear.” The British faced similar challenges in India in the nineteenth century. While challenging, these issues are not insurmountable. Scholars can interview Iraqis and access Arabic language sources in order to supplement U.S. military accounts, as Marc Lynch did in a recent article on the Awakening. Even if they could not interview Iraqis for the article, Biddle et al. could easily have made more extensive use of existing interviews with Iraqis, such as the 2009 Marine Corps study they cite. For example, , Biddle et al. argue, apparently based on just three of their interviews, that the 2005 attempt at ’Awakening‘ around Al Qaim in western Anbar failed and was of at best modest significance (19-20). Yet the Iraqis interviewed for the 2009 study almost uniformly understood Al Qaim to be a success and frequently identified it as the birthplace or inspiration for the rest of the Awakening. This is a serious disconnect between U.S. and Iraqi sources, which has major implications for the authors’ counterfactual argument. If the Awakening effort in Al Qaim in 2005, well before the surge, was ultimately a success then there is no reason to believe that the surge was necessary for Awakenings elsewhere in Iraq. Similarly, Biddle et al. argue that the motivation of Sunnis for joining Awakening movements was to receive U.S. payments and achieve a de facto cease fire. Yet in the 2009 interviews, the discussion of money by leaders of the Anbar Awakening was primarily about Al-Qaeda in Iraq’s financial resources and payment of money to inhabitants of Anbar to buy their loyalty, with almost no mention of U.S. payments. Several interviewees also made clear that they raised their own money to fight Al Qaeda rather than (or at least in addition to) getting payment from U.S. forces. Thus readily available Iraqi interviews present a very different viewpoint from that of the U.S. officers that Biddle et al. interviewed on at least two critical aspects of the Awakening: its early viability without the surge and its motivations. One is left to wonder if there are other aspects of the argument of Biddle et al. argument, such as the calculations of Shia militia members, that would show significant difference between U.S. and Iraqi interviews and perspectives. The foregoing discussion is not intended to argue that one cannot use ‘third-party’ primary sources for a conflict at all, but rather that they must be used with care and checked against other sources, particularly accounts from those native to the conflict. The failure to directly engage with Iraqi perceptions is deeply problematic for an analysis that hinges on claims about Iraqi political dynamics. Biddle et al. have at best told an American story about Iraq that may or may not accord with an Iraqi story about Iraq. While their effort is commendable, it is at best an early exploratory effort at explaining what happened in Iraq during the critical period of the war. Only after sifting through the various narratives, Iraqi and American (and likely Iranian as well), and attempting to synthesize them could one begin to claim to have tested the surge. Austin Long is an Assistant Professor in the School of International and Public Affairs and a Member of the Arnold A. Saltzman Institute of War and Peace Studies at Columbia University. He was previously an Associate Political Scientist at the RAND Corporation. In 2007-2008, he was an analyst and adviser in Iraq, first to Multinational Force Iraq’s Task Force 134/Detention Operations and then to Multinational Force-West headquarters. In 2011 he was an analyst and adviser to Combined Forces Special Operations Component Command Afghanistan. He received his B.S. from the Sam Nunn School of International Affairs at the Georgia Institute of Technology and his Ph.D. in Political Science from the Massachusetts Institute of Technology. Most notable among supporters are Senators Joseph Lieberman and John McCain. See John McCain and Joe Lieberman, “The Surge Worked,” Wall Street Journal, January 10, 2008. See also Kimberly Kagan, The Surge: A Military History (New York: Encounter Books, 2009) and Max Boot, “The Truth about Iraq’s Casualty Count,” Wall Street Journal, May 3, 2008. As Stathis Kalyvas argues, violence in civil war tends to cluster in areas where neither side dominates. See The Logic of Violence in Civil War (New York: Cambridge University Press, 2006). See Biddle et al. fn 34, p. 19. The referenced interview is from Gary W. Montgomery and Timothy S.
in Iraq, 2004–2009 (Quantico, Va.: Marine Corps University, 2009). See for example Will Bardenwerper, “For Military, Slow Progress in Foreign Language Push,” New York Times, September 21, 2008; Andrea Elliot, “For Recruiter Speaking Arabic, Saying Go Army Is a Hard Job,” New York Times, October 7, 2006; and James Glantz, “Iraqi Translator Is Accused of Bribery in Kickback Case,” New York Times, March 25, 2006. I worked extensively with several different interpreters in the fall of 2007 to interview Iraqis detained by U.S. forces so my views are amplified by personal experience. Gregory Daddis, No Sure Victory: Measuring U.S. Army Effectiveness and Progress in the Vietnam War (New York: Oxford University Press, 2011), p. 120. Marc Lynch, “Explaining the Awakening: Engagement, Publicity, and the Transformation of Iraqi Sunni Political Attitudes,” Security Studies v.20 n.1 (2011). See footnotes 32 through 36 on pp. 19-20 which indicate their primary sources are interviews 29, 46, and 48. Montgomery and McWilliams, vol. 2, pp. 12, 48, 108-110, 141-143, 154-155, 168, 204, 215, 255, 265. Yet not even all Iraqis in this collection agree, see pp. 135-136 for a viewpoint that downplays success in Al Qaim. This underscores the need to cast a wide net on primary source accounts. Ibid., pp,. 20, 25, 141, 152, 169, 196, 224. Ibid., pp. 32, 199, 201.